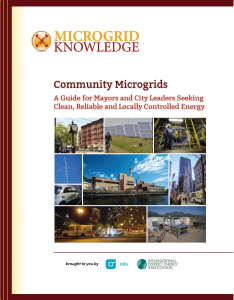 MicrogridKnowledge.com today released a guide to assist mayors and other city leaders who are exploring community microgrids as a way to gain more local control over their energy supply. The 18-page report, “Community Microgrids: A Guide for Mayors and City Leaders Seeking Clean, Reliable and Locally Controlled Energy,” provides big-picture insight into the community microgrid trend, as well as specific advice to help municipalities that are considering microgrid development. 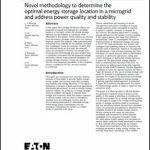 Written in accessible prose, the guide profiles several cities and towns that operate microgrids or have them in planning. Its six chapters also explore the evolution of the contemporary microgrid and look at both immediate and future benefits, steps to get started, financing, incentives and microgrid revenue potential. A modern microgrid is a small-scale power grid that often integrates efficient and clean electricity and heat, energy storage and smart grid technologies. It can operate independently or in conjunction with the area’s main electrical grid and can provide back-up power, services or support to the main grid during heavy demand periods. “Community Microgrids: A Guide for Mayors and City Leaders Seeking Clean, Reliable and Locally Controlled Energy” is available for free download at MicrogridKnowledge.com and EnergyEfficiencyMarkets.com. The guide is sponsored by the International District Energy Association and OBG. MicrogridKnowledge.com is the first independent, international news and feature website dedicated solely to the microgrid market — an industry expected to be worth as much as $40 billion by 2020, according to Navigant Research. EnergyEfficiencyMarkets.com is a business-to-business news and feature website that focuses on disruptive energy technologies and the efficiencies they bring to businesses and consumers in North America.